Is Renting Your Wedding Dress Worth It? Modern brides have more choice than ever when it comes to buying a wedding dress – traditional salon purchases, buying PreOwned, or renting. For brides on a budget, renting sounds tempting option (after all, the guys have always done it). But in reality, renting isn’t always the cheapest option. And it has big drawbacks. 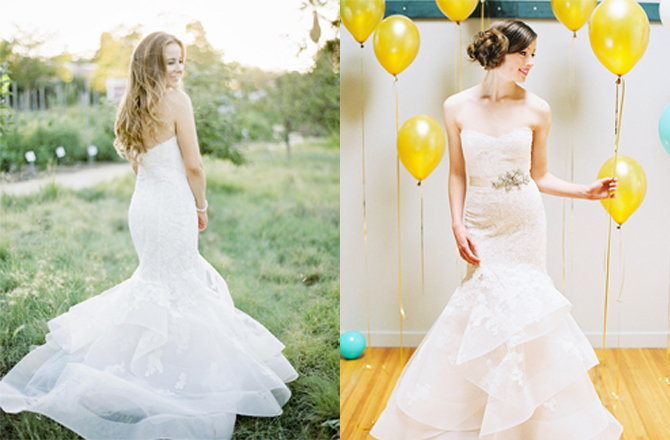 Fit takes a wedding dress from pretty to perfect. Almost all wedding dresses need at least a little bit of alteration to make the fit exact. With rental, alterations simply aren’t an option. So, while you might be wearing your dream dress, it may not look as amazing as it could. Wedding gown rentals have strict timelines. Typically, you’ll receive the dress only a few days before your big day and will need to ship it back immediately after. For many brides, that’s not enough time with one of the most special gowns they’ll ever wear. Normal wear is excepted with a rental, but anything exceptional could quickly become costly. A bride should enjoy her wedding without fearing every wine glass bearing guest that approaches to offer congratulations. Brides can actually save more than they would with rental, by purchasing PreOwned. Let’s use Monique Lhuillier’s stunning Saffron gown as an example. 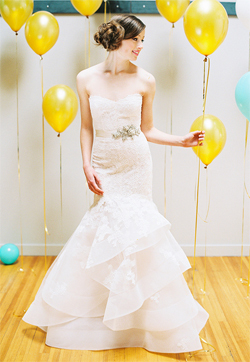 A bride can purchase this gown used for approximately $2,500. Or rent it for $1,225. By purchasing it PreOwned, she owns the dress. That means that she can alter it to exactly her measurements and ensure a perfect fit. She can also wear it worry free. After her big day, she can budget to clean the gown ($250) and then re-sell it. She can expect to earn up to $1,600 on resale, making her net cost to wear the dress only $1,150. Less than the cost of rental. And with more joy (and less headaches). One Response to Is Renting Your Wedding Dress Worth It? It’s a cool idea. Thanks.